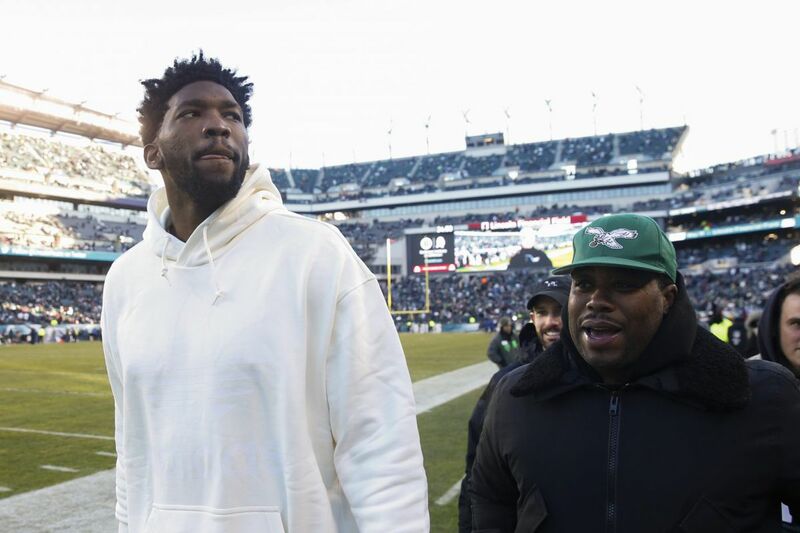 Even Joel Embiid knew where the story was for the last two months. I don't know about you, but it feels as if we are just now emerging from Eagles Tunnel. It took a full two months to navigate and now it is time to come blinking back into the light, take a good look around, and figure out what the heck is going on elsewhere. When the last toll booth is manned by a 295-pound leprechaun Mummer screaming for exact change, it is finally all right to find a safe exit ramp from the glorious madness. If Flyers ever won the Stanley Cup, who would 'Jason Kelce' their parade? The tunnel trip began, at least for me, on Dec. 10 in Los Angeles Memorial Coliseum when quarterback Carson Wentz tore up his knee, Nick Foles took over, and hope for the Eagles' season went from a roaring fire to a small, flickering flame. That's not the way it turned out, of course, but the journey from that bittersweet dusk in L.A. to the rain of confetti in Minneapolis was as consuming as the inferno itself became. The pedal stayed on the floor and you didn't dare change lanes. So, in other words, I've got a little catching up to do. Sixers, let's start with you. How is that rookie of the year race going between Ben Simmons and Markelle Fultz? I was really intrigued by that one. What? Fultz hasn't played yet? I remember something about a muscle imbalance in his shoulder, but that was months ago. Surely, that's been straightened out and his shot doesn't look as if it comes out of an egg beater any longer. Not really, huh, and now general manager Bryan Colangelo says that Fultz might not play again this season while the head bone connected to the shoulder bone is put back in proper alignment. Well, that doesn't make that trade with Boston look any smarter, the one in which the Celtics got a number-one pick from the Sixers and were still able to select Jayson Tatum, whom they wanted in the first place. I did see that Tatum is shooting 43 percent on three-point shots. Not too shabby. But what about Ben? I know people were worried about his outside shooting, but he had a full year in the team's gym with Brett Brown, the shot doctor. That must have helped his range? Hmmm, 30.7 percent on shots 10 feet and out. Well, at least he can get to the rim and even if he doesn't score, he can get to the foul line. That's good, right? Only the first part? Well, Joel Embiid then. Give me the good news there. He's averaging 24 points, 11 rebounds, 32 minutes a night, and is now allowed to play back-to-back games? Fantastic. With that to build around and the good cast of role players, the team must be locked into a playoff spot. Not quite yet, but the rest of the schedule is favorable? OK, got it. Flyers, how about you? Last time I looked, you were just sort of lazing around in the middle of the pack, with a middling offense, a terrible penalty kill, and another in a long line of goalies who seemed just good enough to get you beat in the playoffs. Now, I look and you're seventh in the conference in points, but it's a crowded race. You are a handful of points out of fourth, but also a handful out of 11th. So, what's it going to be at the trade deadline on Feb. 26? Go for it, in true Flyers fashion, or work toward the future? You are inclined to stay the course right now, is that it? Well, it would be a lot to fix for a Stanley Cup run this season, particularly if Brian Elliott can't improve on a season in which he is currently 30th among NHL goalies in save percentage and 20th in goals against average while playing for a team that is among the top five for fewest shots allowed per game. I agree that doesn't inspire confidence. No problem. I'll check in again next season. All right, Phillies. Pitchers and catchers report this week. There is either the smell of leather in the air or maybe it's just coconut oil. I have to tell you, one of the really interesting things I want to watch is the shortstop competition between Freddy Galvis and J.P. Crawford. I know Crawford is pushed as a superstar on the rise – despite hitting .243 in Lehigh Valley last season – but, man, I love watching Galvis play the position. Wait, you did what? What did you get? Enyel De Los Santos? Is that a player or an island chain in the Pacific? Galvis played 162 games last season. That's a lot of showing up. All right. What about the rotation? I know you must have swung some deals. I was worried it was just going to be Aaron Nola, Jerad Eickhoff, Vince Velasquez, Ben Lively, and Nick Pivetta again. A reasonable worry, huh? What's that? Carlos Santana is the first baseman now, signed as a free agent? Solid player, switch-hitter, good fielder. But that means Rhys Hoskins has to stay in the outfield. I'd much rather have Aaron Altherr and Nick Williams on the corners next to Odubel Herrera. Well, you can't get everything you want, but at least baseball is back soon, and it will be interesting to see how it goes for the Phillies, and maybe just as interesting to see what the rest of their seasons hold for the Sixers and the Flyers. It will be difficult to be as interesting as the free fall through the Eagles Tunnel, though. That twisting adventure might not have really taken years off our lifespan, but it definitely wiped out two months of it.